7 Kids and Us: Foster Farms Introduces Gluten Free Corn Dogs! 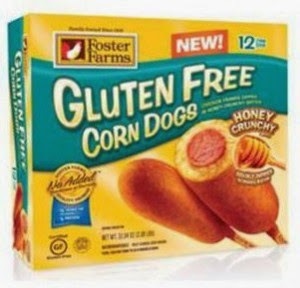 Foster Farms Gluten Free Corn Dogs are made with 100 percent chicken franks and dipped twice in honey crunchy batter. Easy to heat-and-eat, Foster Farms Gluten-Free Corn Dogs make for a quick snack and easy meal the whole family can enjoy. Since Riley was young, he has had a gluten allergy, so he had never tried corn dogs. I was really excited to let him try them, and he said he never had anything so good in his life! I am so happy to finally have a Gluten Free option from Foster Farms. Foster Farms Gluten Free Corn Dogs are certified by the Gluten Intolerance Group GIG through a program authorized by the Gluten Intolerance Group of North America. The certification guarantees that Foster Farms Gluten Free Corn Dogs meet strict guidelines and practices required by the GIG certification body. All facilities producing gluten free corn dogs are independently audited each year. All ingredients are required to be gluten-free and are labeled, stored & processed separately from all other products. Foster Farms Gluten Free Corn Dogs have less than 10 ppm of gluten per serving. Foster Farms Gluten Free Corn Dogs are available in packages of 12. Foster Farms Gluten Free Corn Dogs can be prepared in the microwave or in a conventional oven. Foster Farms Gluten Free Corn Dogs are available nationwide at many retailers including: Safeway Safeway, Vons, Randalls, Tom Thumb, Kroger Kroger, Frys, Smiths, Raleys, Lucky, Albertsons, Giant Eagle, Woodmans, Copps/Roundy’s, Schnucks, Food Lion, HyVee, and Marsh. Giveaway! FIVE readers are going to WIN a FREE box of Foster Farms Gluten Free Corn Dogs! Enter using the rafflecopter form below. Good Luck!